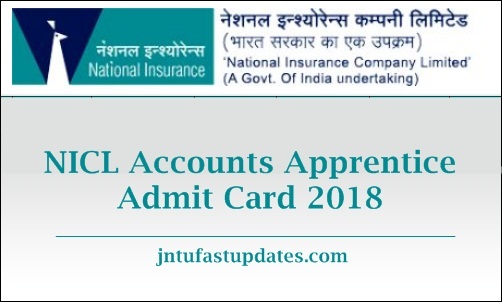 NICL Accounts Apprentice Admit Card 2018: National Insurance Company Limited (NICL) Accounts Apprentice written test is going to be conducted shortly on December/January. All the applicants who have applied for the NICL Apprentice posts will have to attend the examination as per the scheduled dates. In order to attend the NICL written test round, the competitors must have to download the admit card before going to the test. The NICL Accounts Apprentice Admit Card is the most required document to attend the test. Applicants can download NICL Account Apprentice hall ticket from the official website, nationalinsuranceindia.nic.co.in. Candidates can download and preserve the hall ticket safely to carry to the examination. The examination officers will check the admit cards of the candidates before allowing to the examination. In that time, if they forget to show the admit cards, they will not be allowed to the examination. Hence candidates who are going to NICL Accounts Apprentice examination are hereby informed to carry the admit cards without fail. Aspirants can check the hall ticket downloading date, downloading process, and more information from the following. National Insurance Company Limited (NICL) is the national level organization; the organization has recently released the official notification for 150 posts. Many of the candidates seeking to get the accounts apprentice posts from 10th November to 27th November 2018. Many of the candidates have applied for the announced posts during the application dates. The NICL received more than 2 lakh applications for the accounts apprentice posts. The organization is going to shortlist the candidates based on their performance in written test and interview rounds. Candidates scoring the good merit in the selection rounds will be appointed in announced posts. Name of the Organisation National Insurance Company Limited (NICL). Selection Procedure Written Exam and Interview. Candidates competing for the NICL Accounts Apprentice examination can download the hall ticket from the official website, nationalinsuranceindia.nic.co.in. The hall ticket/admit card will be accessible to download before 10 days of the examination (tentatively). Hence the hopefuls can visit the NICL website and download the admit cards. Candidate’s information such as Name, register number, hall ticket number, signature and photograph of the candidate and more details.